After thinking about it, there isn’t a single answer we could offer. We have heard far too many bad pieces of advice. But we have narrowed it down to just a few. If anyone gives you any of the advice explained below, turn and walk away. 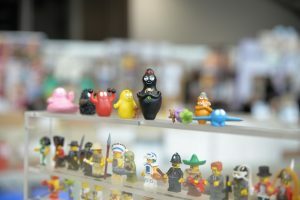 The collectibles market is controlled almost entirely by supply and demand. For example, take Tiffany lamps. It is not uncommon for an original Tiffany to command tens of thousands of dollars at auction. But why? Is there anything special about a Tiffany lamp in terms of form or function? No. Tiffany lamps are so valuable because collectors agree on that value. If nobody was buying a Tiffany for more than a few hundred dollars, that is all they would be worth. Such is the nature of collectibles. We say all that to say this: the idea that you should hold out until you get your price is bad advice. Hold out long enough and you may never sell. You may reach moving day and end up having to donate your collection to charity because you refused to take that nice offer you got a few weeks back. The flip side of holding out until you get your price is taking any offer that comes your way. This is just as foolish, especially since buyers like to haggle. They start low with the expectation that you will counter with a higher price. The point is to go back and forth until you agree on a price. A better way to handle this is to spend some time researching the value your collectibles on the open market. Whatever that value, it serves as a starting point for your negotiations. Then be ready to haggle with a buyer willing to make you an offer. Has anyone ever told you not to sell your collectibles to anyone other than a dealer? If so, ignore that advice. Dealers do indeed make good customers, but they are not the only ones out there buying. Also consider the fact that dealers will intentionally low-ball you in order to leave as much room as possible for their own profit. Be willing to entertain offers from any buyers, be they dealers or otherwise. No buyer should be ignored without at least listening to what he or she has to say. Our last bit of lousy advice says that consignment auctions are the best way to go for collectibles. An auction might be appropriate in your case, but it might not be as well. Do not simply assume because that is what you’ve heard others say. A consignment auction is only as good as the people who attend it. There is no point in trusting your collectibles to a local auction company with a lousy reputation. There’s no point in offering your collectibles for sale in an auction that is virtually guaranteed to get low attendance due to the scheduled date and time. Auctions can be a good avenue for selling collectibles. But they have to be chosen wisely. Not every auction company is equal, and not every auction is worth attending. If you have collectibles to sell in advance of downsizing, we urge you to get advice from professionals. Do not pay attention to what you read online or what your neighbors down the street have to say. Get qualified advice from people who sell collectibles for a living. You will be happier in the end.